Old Blighty celebrated Christmas Eve of 1744 by weighing the Tyburn’s triple tree with no fewer than 18 thieves — 16 men, one woman, and one 14-year-old boy. Half of them were fellows in a “pestiferous Crew,” as the Newgate Ordinary colorfully describes it, the Black-Boy-Alley Gang. Such a profligate Sett of audacious Bloodthirsty, desperate, and harden’d Villains, have of late started up to infest this great City, as make it quite unsafe to walk even in the most public Streets … Whether we consider the Number of the Malefactors, the Nature of their Crimes, the Age of some of the Offenders, (one particularly, which was a perfect Child) or the Apprehensions into which the Inhabitants of this great City were for some Time thrown, by their Excessive Boldness in committing their Robberies, all wears the Face of Horror and Confusion. As one might suppose, these rascals based in the environs of Black Boy Alley, a no-longer-extant passageway onto the Thames in Holborn. Rictor Norton, whose work on crime in 18th century England and especially the proto-gay “molly” culture, has often been referenced in these pages, has a fascinating exploration of the Black Boy Alley gang here. As usual one can read the entire tract at at the Old Bailey Onine; we’ve also embedded it below in pdf form. Of this abominable Sett, the better Sort, (if indeed any better can be of such a Crew) have found the way to escape both Shame and Chasment, very probably, by commuting with their Purses for the safety of their Persons; and as for the latter, who were all Soldiers, they escaped what was due to their Deserts, by being concerned with their Superiors; so true this our righteous Age, that Wickedness in high Places is sure to go unpunished. 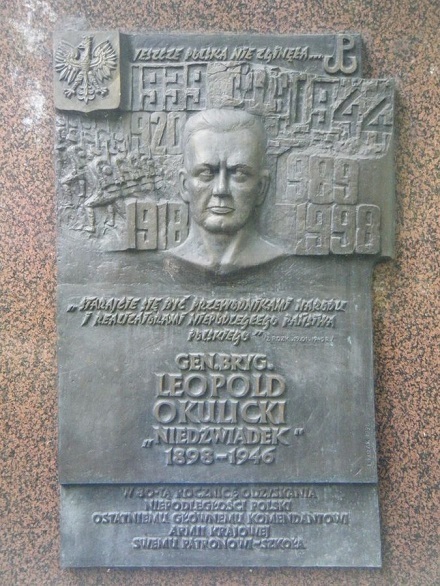 The fate of the last Commander in Chief of Home Army General Leopold Okulicki “Niedzwiadka”, imprisoned in Moscow and murdered there, symbolize the postwar fate of the Home Army and of Poland. On this date in 1946, Polish Home Army General Leopold Okulicki was murdered by the NKVD in a Moscow prison. Okulicki (English Wikipedia entry | the much more detailed Polish) embarked his military career at the tender age of 16, when he ditched school in favor of an Austrian legion on the eastern front of World War I — then segued directly into newly independent Poland‘s subsequent war against the Soviets. Already a veteran soldier, Okulicki proceeded to the Warsaw military academy and made soldiering his career. He had advanced to the brass by the time Hitler and Stalin destroyed Poland in 1939. Okulicki had the tragic honor to maintain the hopeless defense of Warsaw, but went underground thereafter with the remains of the Polish state — hunted by Germans and Soviets alike. The NKVD caught him in January 1941, but his residence in the discomfiting environs of Lubyanka prison was ended by the Soviet Union’s arrangement with Poland following Operation Barbarossa. Paroled back into the field, he played a leading part for the Polish Home Army for the balance of the war — finally becoming its supreme commander in the last weeks of the war. Now that the Nazis were no longer knocking on the gates of Moscow, the Soviets renewed their interest in detaining Okulicki, which was again effected with relative ease. (Comparing German and Soviet secret police, Okulicki would say that the NKVD made the Gestapo look like child’s play.) Sentenced “only” to a 10-year prison term at the Russians’ postwar show trial of Polish leadership, Okulicki disappeared into Soviet detention and was never seen again. 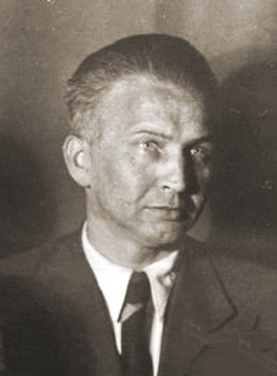 In the Khrushchev era, the USSR revealed that Okulicki had died on Christmas eve of 1946 at Butyrka prison; subsequent revelations of the medical records there revealed that he had succumbed to organ damage suggestive of having been beaten to death — perhaps as punishment for hunger-striking. The post-Communist Russian state has posthumously exonerated Okulicki of his show-trial conviction; he is, of course, an honored figure in post-Communist Poland where many streets and squares bear his name. Plaque honoring Gen. Okulicki in Warsaw. (cc) image from Tadeusz Rudzki. 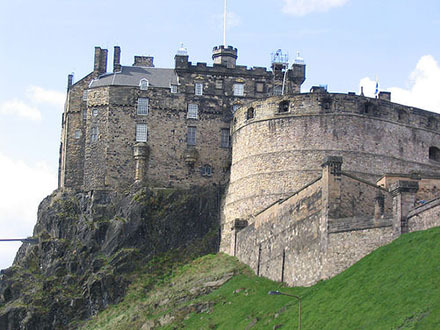 The plot was a bold conspiracy of Highlanders to seize Edinburgh Castle itself, which would have been every bit the coup it sounds like. Sergeant William Ainslie and two other soldiers of the garrison had been bribed to admit the plotters via a sally port. (cc) image from Stephanie Kirby. One minor problem: the whole enterprise depended on the ability of at least 83 people to keep a secret, but “they were so far from carrying on their affairs privately, that a gentleman who was not concerned told me that he was in a house that evening, where eighteen of them were drinking, and heard the hostess say that they were powdering their hair to go to the attack of the Castle!” Even so, the word only barely got out in time, the conspirators self-defeating by showing up late (too much time powdering?) and with ladders that were too short. William Ainslie, the sergeant who was planning to open the gate for the Highlanders, had to shout the alarm and play it off that way once he realized that the dawdling had wasted the opportunity, but he was soon found out and spectacularly hanged over the castle wall for his trouble. The inevitable hanging-ballad broadside (“The Lamentation, and Last Farewell, Of Serjeant William Ainslie, who was executed over the Castle-Wall of Edinburgh for High Treason and Treachery, on Monday the 24th of December, 1716”*) emphasizes the pecuniary motive at the expense of the patriotic, but maybe it should have been dedicated to the principle that loose lips sink ships. for which I’m doom’d to Die. As I in Fetters lay. Since I am Doom’d to Die. My Hour is drawing nigh. Over the Wall to dy. I just deserve to dy. With God who lives on high. And for it I must die. For which you see me die. On this date in 1635, the aged cunning-woman Hester Jonas was beheaded as a witch in the city of Neuss. 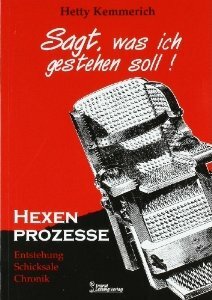 Torture chair-illustrated title page of Hetty Kemmerich’s study of German witchcraft prosecutions, including but not limited to Hester Jonas’s. Sagt, Was Ich Gestehen Soll! has not been translated from German, but is available from Amazon.de. Jonas (English Wikipedia entry | German), one of the better-known German witch-hunt victims, was an epileptic midwife who knew her way around the mandrake. She was around 64 years of age when longstanding rumors of her witchiness triggered her arrest in the Hexenprozesse-crazed atmosphere of the Thirty Years War. The city’s mayor came right out and accused her of taking the devil into her bed, signaling that Jonas would have a difficult time escaping the scaffold. She managed to escape confinement the very night after she made these “admissions” but was re-taken, and her attempts to repudiate her previous self-incriminations flogged out of her. After the executioner struck off her head, burned her body, and scattered her ashes to the four winds, her husband got the executioner’s bill for 65 Thalers. 20th century Dusseldorf poet Peter Maiwald wrote a “Ballade von der Hester Jonas” in honor of our date’s victim. The German band Cochise released an interpretation of this ballad on its 1979 album Smoke Signals. “Tap us thy Christmas beer. “No outrage on us do. Bring in the beer and wine. And ate her meat and bread. She would their beds prepare. Through the dark forest sped. To Drost Sir Peter’s† came. “With us their Christmas keep. “Nor yet but half awake? “Good news from yonder farm. “Where’s now the farmer’s pretty wife? “Up up, Sir Nilus Ufridson! The blows he dealt around. He broke his sword in twain. “I’ll try good words and gold. The people’s jest and scoff. Twelve heavy chests of gold. * Located on the Danish island of Fyen, Fyn, or Funen. ** The Danish Jul runs all through December up to Christmas Eve, Dec. 24; that date, Christmas Eve, is the big Yule celebration in Denmark. † I situate this execution in the 13th century based on Drost Peter’s appearance in this historical romance of Danish King Erik VI Menved‘s youth. There might well be something to that, but Iran’s “baseline” starting point for any such escalation is already pretty high, and had already been trending up. It was in that spirit at dawn this day last year that Tehran’s Evin Prison conducted a mass hanging of eight men and one woman, with a tenth potential victim spared at the last moment only due to the absence of his family. All were executed for homicide, including the woman, one “Tayyabeh”, who insisted that she was tortured into confessing to burying her 8-year-old stepdaughter alive.